The West Bengal government has announced a West Bengal Krishak Bandhu scheme (Prakalpa) to improve the economic condition of the farmer. The initiative is aim to provide financial help to the impoverished farmers in West Bengal. The scheme will provide money to the farmers in two installments. In addition to that, premium money will be assigned to the farmers but that will be deposited by the government of West Bengal on behalf of the farmers. It is believed that the scheme would become beneficial to the agricultural farmers as the scheme is committed to improve the agricultural farming condition in the state. Improvement to the Agricultural Sector- The scheme will provide assistance to the agricultural sector to promote the condition of the farmers in West Bengal. The assistances are believed to help with significant crop production with the help of advanced technology involved in farming. 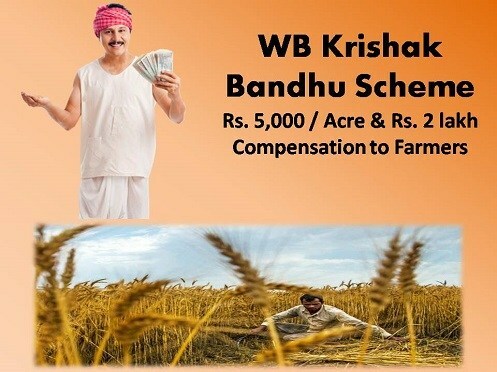 Financial Assistance- The WB KrishakBandhu Scheme is offering Rs 5000 per year to each agricultural farmer. The scheme is also applicable on Kharif and Rabi crops’ farmers. Crop Assistance- Along with crop assistance to the farmers the government will deposit the insurance premium on behalf of the farmers. Family Insurance-According to the terms of the insurance policy, the each farmer’s will get Rs 2 lakh as compensation money on accidental death or suicide. The policy is made to help the farmers along with improvement in farming. Beneficiaries-The primary objective of the scheme is to level up the condition of 72 lakh farmers and farm laborers. The scheme is limited to the residential farmers of West Bengal. Residential Proof- As the scheme was announced by the government of West Bengal, as per the terms and condition of the scheme, the scheme will only be implemented on the farmers who have residential proof of being a resident of West Bengal. Professional Criteria- According to the terms and condition of the scheme, only agricultural farmers are eligible to apply for the scheme to the all the benefits the scheme is offering. Criteria of age- Applicant has to be 18 to 60 years old to be eligible for the application. To get the benefit of the scheme one needs to produce age proof. Personal Identification- To avail the benefit of the scheme one needs to produce Aadhar or voter card. Details of bank Account-The applicant need to provide his bank account details to get the hassle free money transfer. According to the scheme, the farmer is supposed to get the money directly in their bank account without any peripheral complication. To become the potential beneficiary the farmers need to fill up the application form. The application form for West Bengal Krishak Bandhu Scheme 2019 will be available on the official website. To get the promised death benefits and salary scheme, one needs to follow the below stated steps. One needs to log in to the official website- http://matirkatha.net/. One will find ‘Krishak bandhu’ option on the home page. Right after clicking on the option a new page will open up and one has to click on the ‘Krishak Bandhu Sign In’ option to sign in to the website for registration. After the registration a log in window will open. Then the applicant needs to click on the ‘Sing Up’ option. After singing up a registration form for West Bengal Krishak Bandhu Scheme will appear. The applicants need to provide the details about him to fill up the form. The candidates need to give their username and password. The main objective behind launching the scheme is to improve the condition of the farmers by waiving off the financial burden from their shoulder. The government will also take care of the tax the farmers pay on the basis of their agricultural land. The honorable CM announced that the tax will be waived off. As of now, 80% of the tax is paid by the state government and the 20% is paid by the central government. On the other hand, CM rejected PM Narendra Modi’s proposal of paying for the crop insurance to help the farmers. In conclusion, it is evident that the honorable CM wanted to shed light on the fact that the scheme is to take care of the overall condition of agricultural farmers. To enhance the condition of the agricultural farmers, this scheme will be beneficial as, it will bring immense help and support to the farmers and their families.